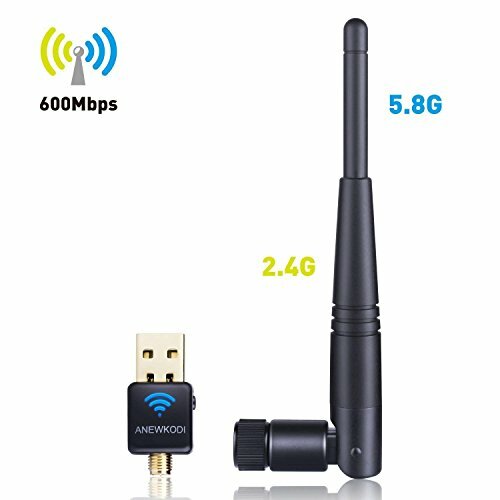 This USB wifi receiver allows your wifi-disabled computers or laptops receive network signals form 5G/2.4G router via a simple plug. It can only receive network signals and creat wifi hotspot, but can not strengthen it (wifi booster does). ★ Works with Any WiFi Routers: By using the AC600 USB WiFi adapter, you can upgrade your PC,laptop or Mac to work with the latest AC WiFi router for faster speed and extended range. No worry about network cabling. ★ Ultra-Fast Wireless Adapter with 802.11ac: Up to 600Mbps Wi-Fi speeds on 5GHz (433Mbps) or 2.4GHz (150Mbps) bands. Dual band reduces interference,freezing and lag when streaming and gaming. ★ Receive Signal / Transmit Signal: 1. Connect you desktop/laptop to network from wireless router. 2. Create a wifii hotspot for sharing with other mobile devices by soft AP function. ★ Easy Setup & Compatibility: Windows 10 is plug and play. Others you can install drivers via CD disc. Once you've run the software, you can simply insert the adapter to get connected. Compatible with Windows XP/7/8/10, Mac OS, Linux (opptional). ★ We offer 12 MONTH WORRY-FREE WARRANTY, if you have any problems when using, just contact us. We must GIVE YOU A REPLACEMENT or REFUND UNCONDITIONALLY !